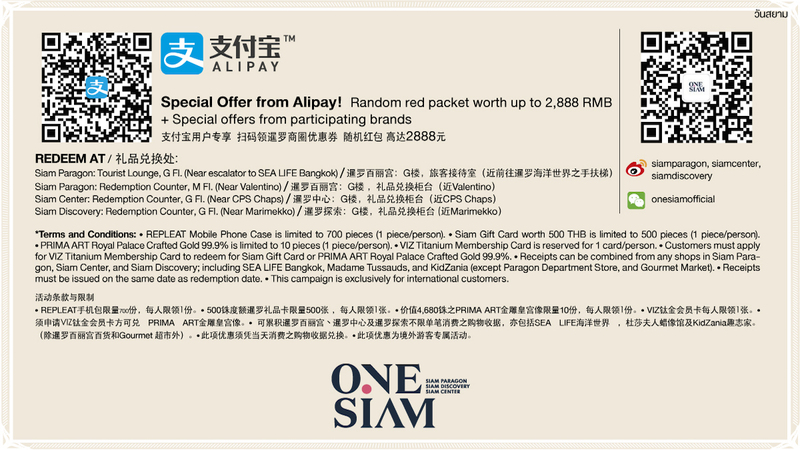 Siam Paragon, Siam Center, and Siam Discovery give you more!!! One of your best holiday experiences when visiting Bangkok is a shopping spree at OneSiam, a global destination of extraordinary experiences, which is home to world-renowned shopping centers like Siam Paragon, Siam Center, and Siam Discovery. Plan your day at OneSiam and enjoy the latest Golden Week Promotion. · Spend 8,000 baht, get FREE Repleat Mobile Phone Case. · Spend 20,000 baht, get FREE OneSiam Gift Card worth 500 baht and VIZ Titanium Membership Card. · Repleat Mobile Phone Case is limited to 700 pieces. · OneSiam Gift Card worth 500 baht is limited to 500 pieces. · Prima Art Emerald Buddha Temple Pure Gold-Plated Frame is limited to 10 pieces. 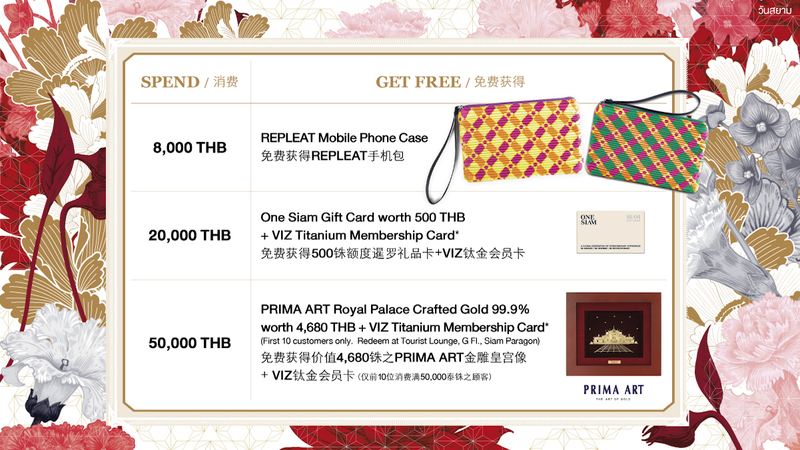 · Customers have to apply for VIZ Titanium Membership Card to get a privilege to redeem for OneSiam Gift Card or Prima Art Emerald Buddha Temple Pure Gold-Plated Frame. · All receipts from Siam Paragon, Siam Center, and Siam Discovery can be included, as well as receipts from SEA LIFE Bangkok, Madame Tussauds, and KidZania (excluding receipts from Paragon Department Store, and Gourmet Market). · All receipts must be issued on the same day of redemption for special gifts. · All receipts which are used for gift redemption for this campaign or any other one cannot be used again. · This promotional campaign is exclusive to international customers.